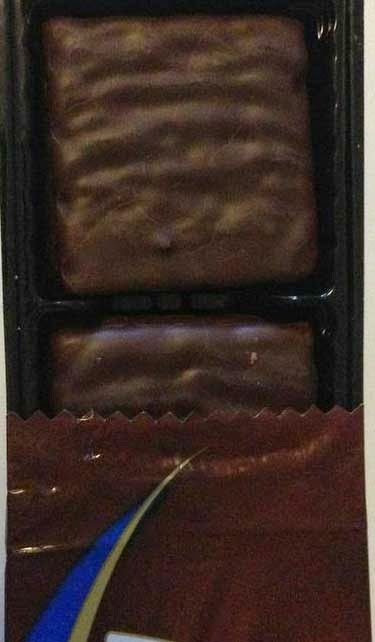 Remi Mint is mint flavoured, dark chocolate biscuits from Swedish cookie manufacturer Göteborgs Kex. The biscuits are very delicate and coated by a thin layer of dark chocolate. The mint flavour is intense and puts the dark chocolate a bit in the background. It's like a After Eight-biscuit with a more powerful mint flavour. Quite yummy. They come in 12 pieces per 100 g package. Är jag sugen på choklad så köper jag alltid dessa härliga chokladrån som dessutom bara innehåller 8,3 viktväktarpoäng per rån!